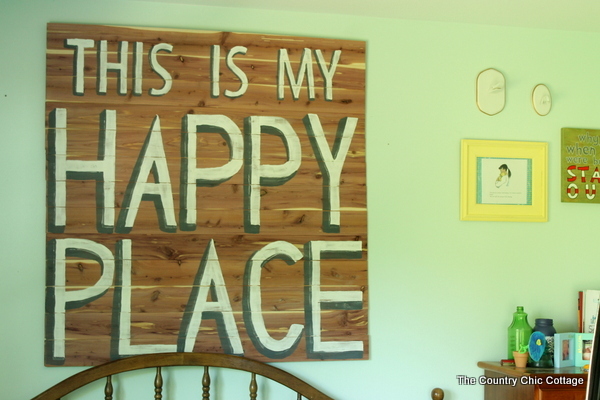 You are here: Home » budget friendly » Wood Pallet Sign — no sawing or nailing required! 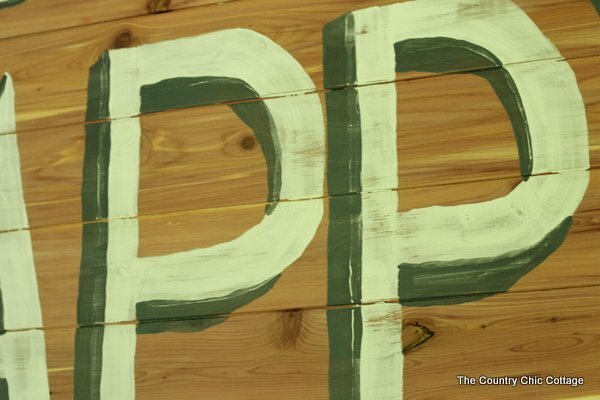 Wood Pallet Sign — no sawing or nailing required! 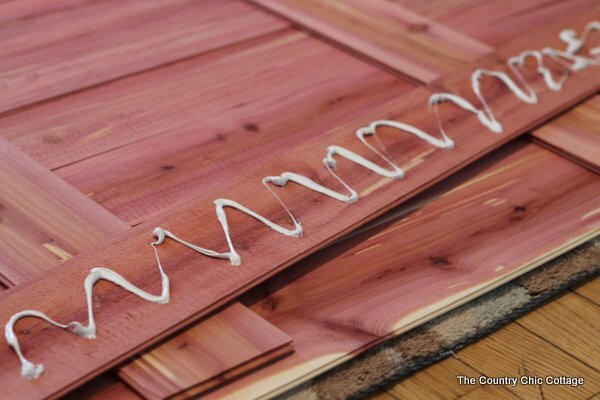 Have you ever wanted to make a huge wood pallet sign but were scared of all of that sawing and nailing? What if I tell you there is a way to make this huge 4 foot by 4 foot sign with no sawing or nailing required. You would jump on that opportunity right? This post is sponsored by Cedar Safe however all projects and opinions are my own. Y’all will be happy to know that a box of these cedar planks is under $30 at Home Depot so this is a super affordable project as well. I would get two boxes to make sure that you have enough to make this extra large sign. 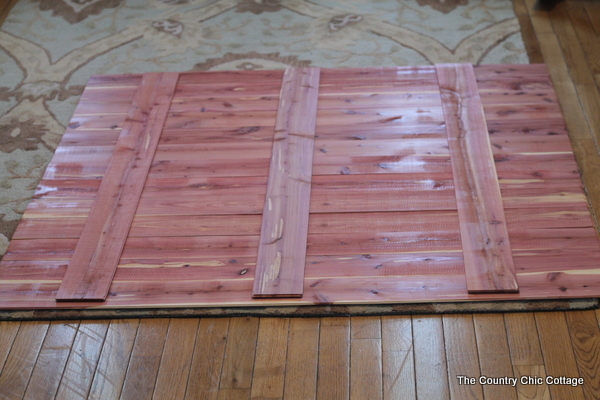 This is tongue and groove cedar paneling that is made to line your closets. 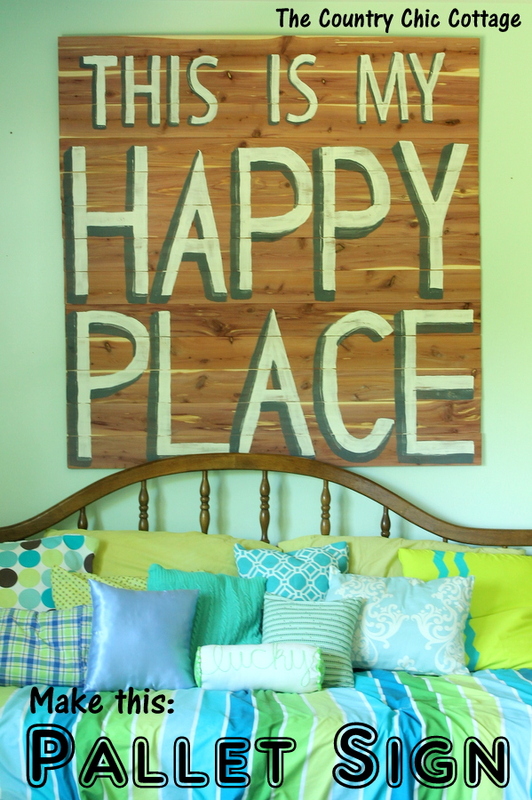 If you have a closet project, save your extra to make this gorgeous pallet wood sign. If you don’t have a closet project, just pick up two boxes and have a sign to hang in your home in no time. NOTE: the lengths within the box vary slightly. 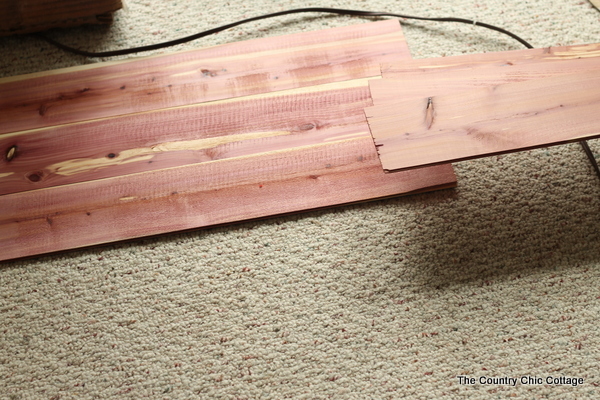 I just started picking planks that were roughly the same length and started clicking them together on the floor with the back side facing up. I used the “back” as the rougher side. If you want a slightly more rustic look, go with the rougher texture to the front. NOTE: Please PROTECT your carpet or floor before starting on this project. Do as I say….not as I do y’all!! Once it is all together and the finished size that you desire, use three planks on the back that will hold everything together nicely. But wait….I said no nailing?? Never fear y’all. 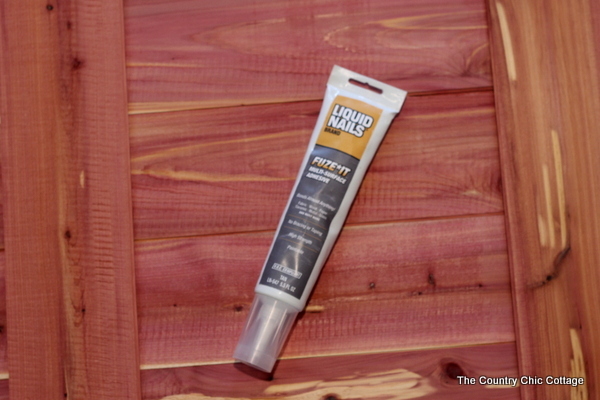 Liquid Nails to the rescue! 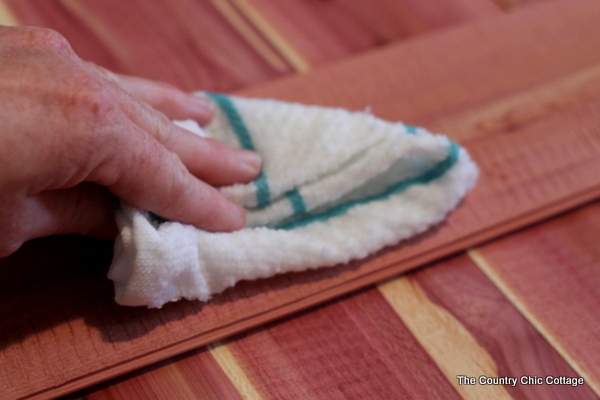 The packaging said the glue would set faster if the surface was wet so I used a rag to set the planks. 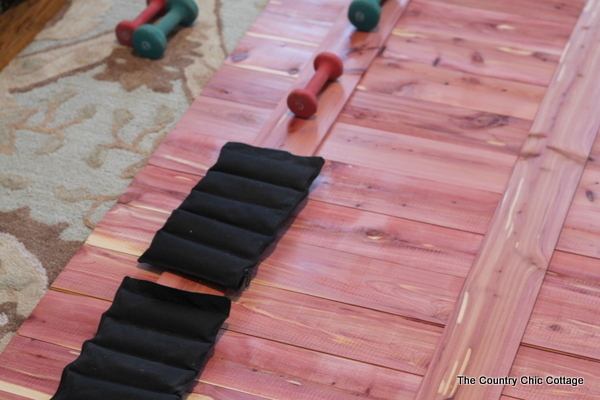 I then applied the glue to the three planks on the back. 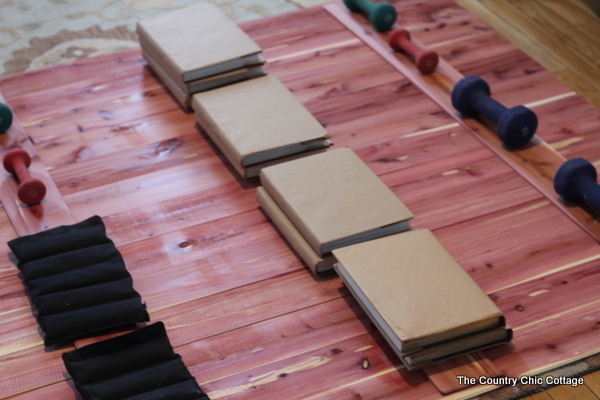 I weighted each plank with what I had on hand to allow it to dry clamped. AGAIN PLEASE PROTECT YOUR CARPET! I almost messed up by not having anything under this sign!! Here is my completed sign clamped and drying. Allow to dry completely according to the directions on your bottle of Liquid Nails. Once completely dry, flip the entire sign over to the front. Next you have to get your letting or image onto the sign. I used a ruler and pencil to draw the large “HAPPY PLACE”. The sheets of paper helped me to determine spacing. 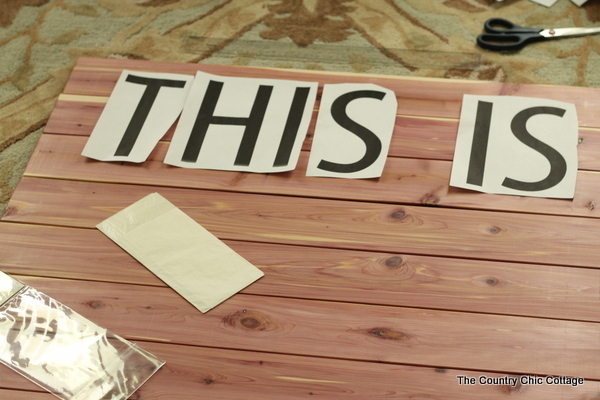 If your letters are smaller (like the “THIS IS MY”), print on sheets of paper and use white transfer paper to transfer the outline to the pallet sign. Next use paint to fill in the outlines you have just drawn. I used chalky finish paint from DecoArt for the white portions and a slate gray I had on hand for the shadows. 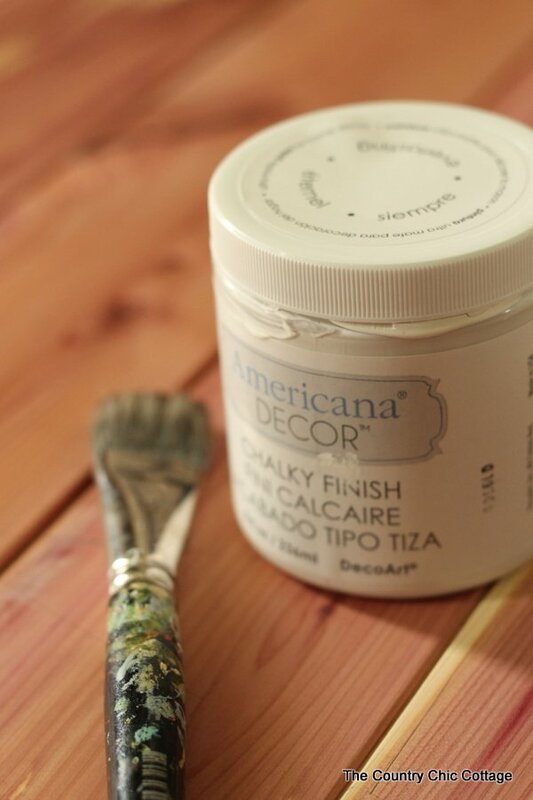 After the white has dried, add on a shadow to each letter for a retro appeal to your pallet sign. I then lightly sanded over the entire sign. I wanted to rough up the paint and give the sign a bit more of a vintage feel. All that is left is to add some eye hooks and wire to the back for hanging. 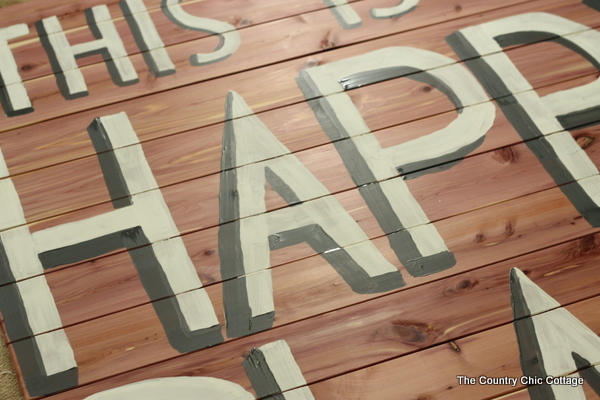 Because the wood is so light the sign itself is remarkably light considering the size. I hung my sign in my craft room over the day bed in that room. Cause y’all that is my happy place. 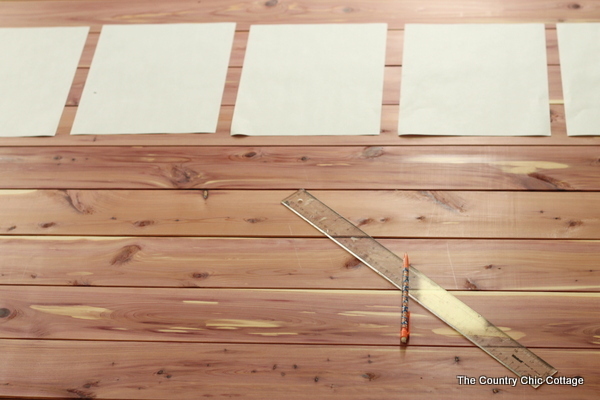 Will you be making your own giant wood pallet sign? 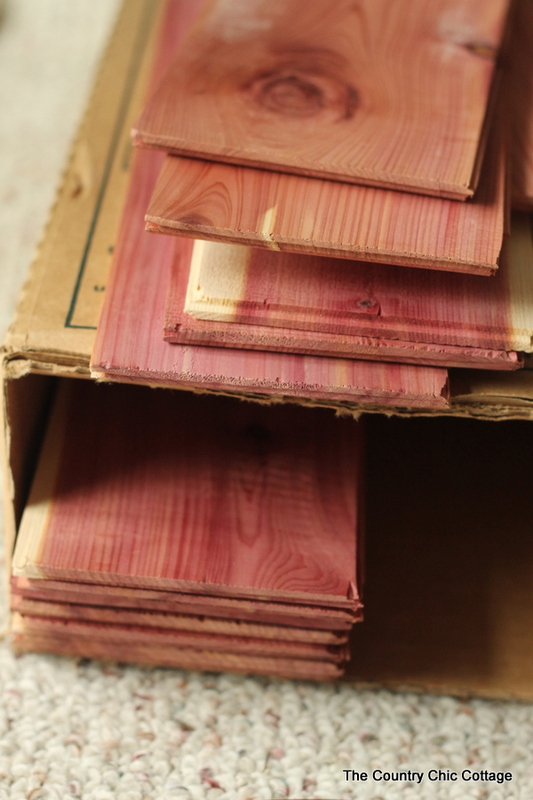 Be sure to purchase a box of Cedar Safe to make this the easiest project you have ever made! Plus you get a HUGE piece of statement art for a super affordable price! This is a great idea! I’ve been kind of grossed out by the trend of picking up pallets from outdoors and using them indoors (as a germophobe), so this is the perfect solution. So so cute! I love the idea of not having to cut or even nail! Love how easy this project came together and that you hung it in your craft room! Totally my happy place too. 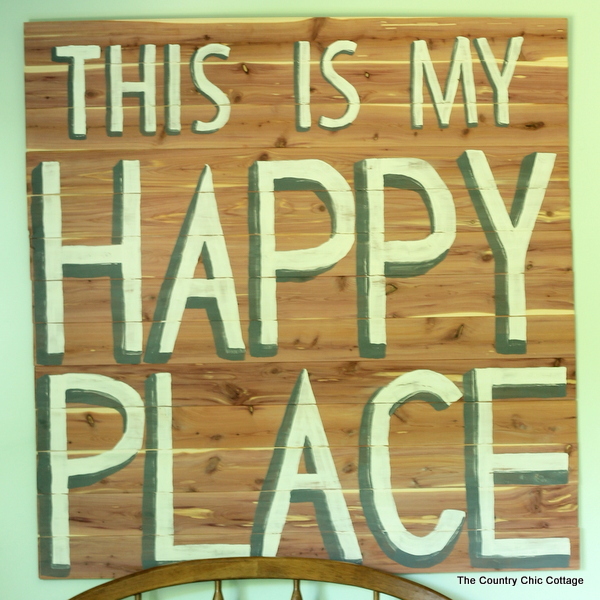 I made a sign out of cedar planks that had been sitting in my dad’s garage for years. It has been hanging in my dining room for several years now and it is still one of my most favorite pieces. It was so easy to make and is such a statement piece! Awesome – LOVE not having to saw! This is super cute Angie! Great idea for the pallet and I love me some liquid nails! Fun sign! I love projects that require no tools!